Drought and flooding, both naturally occurring stressors, are a function of the amount of rain, snow, ice, and fog present in addition to soil characteristics. For forests, growing periods with little water can lead to decreased growth, poor resistance to other stresses, and impaired physiological functions in trees. For example, extreme drought predisposes oaks to the oak decline disease complex involving root disease (Armillaria) and insect infestation. Resulting reductions in hard mast (acorns and beech nuts) production negatively affect wildlife populations, such as mice, voles, chipmunks, deer, bears, turkeys, and even wood ducks and blue jays. The two longest dry periods over the last century in Western North Carolina have occurred since the early 1980s (see Precipitation Patterns). The major impacts of flooding on tree and site resources are poor aeration, alteration of soil structure, anaerobic soils which are much more inefficient at decomposition, and reduced chemical activity. Hurricanes, although uncommon in the region, have recently left wide-ranging devastation. In 2004, rainfall from the remnants of Hurricanes Frances and Ivan caused flooding and triggered numerous landslides in Western North Carolina. Sixteen Western North Carolina counties were designated a federal disaster area. The National Weather Service reported that Mount Mitchell received 46.6 inches of rain. The previous record, set in 1916 at Linville Gorge, was 37.4 inches. U.S. National Atlas. 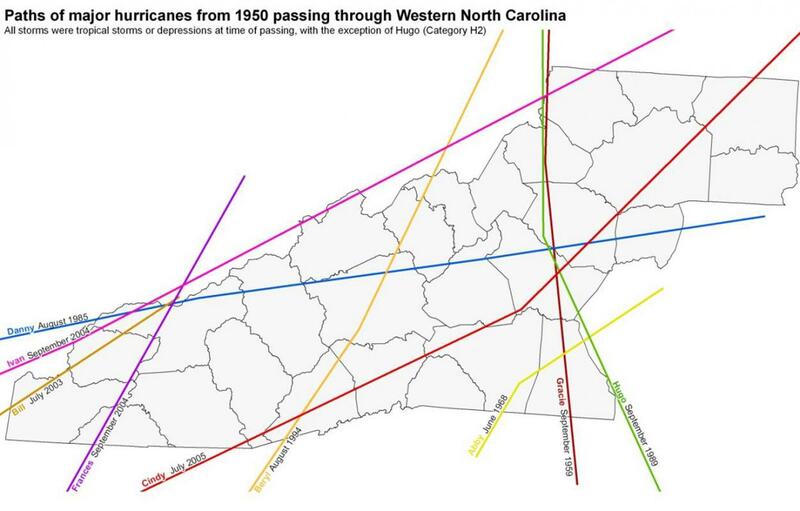 Historical Tropical Cyclone Tracks 1851-2004, www.nationalatlas.gov. Atlantic Tropical Cyclones layer. Accessed from: http://www.nationalatlas.gov/mld/huralll.html. Phillip Gibson. 2004. “Western NC Hurricanes Reveal Opportunities in Floodplain Areas.” Partnerships in Conservation, Fall 2004. Accessed from: http://www.enr.state.nc.us/officeofconservation/one%20nc%20partnerships%20newsletter/pages/westernflood.html.